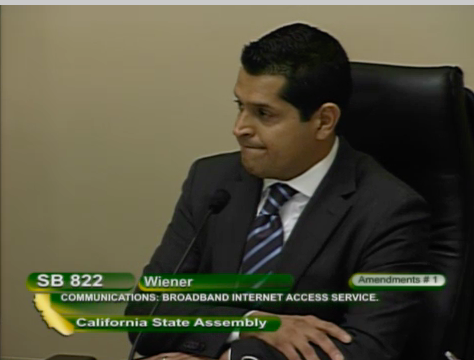 Breaking: in an unprecedented move, the California Assembly’s Committee on Communications and Conveyance just bucked standard procedure and railroaded through a vote to amend net neutrality bill SB 822 by adding gaping loopholes asked for by ISPs like Comcast and AT&T, who are a top donor to the committee Chairman, Miguel Santiago. Call the California Assembly right now and tell state legislators to restore SB 822 to its original form and pass strong net neutrality protections. The forced vote on the Amendments passed 8–0 with two abstentions, with Democrats joining Republicans to eviscerate SB 822, making them the first Democrats to actively help the Trump administration dismantle net neutrality. The level of corruption we just witnessed literally makes me sick to my stomach. These California democrats will go down in history as among the worst corporate shills that have ever held elected office. Californians should rise up and demand that at their Assembly members represent them. The actions of this committee today are an attack not just on net neutrality, but on our democracy. Share this widely so people know that these politicians just sold us all out. Then contact your members of Congress to demand they restore net neutrality at the Federal level.